It’s been a while since I offered “a little about a lot’’ in this space. For those of you who don’t remember, it’s an homage I pay to a former colleague — Reporter/Columnist Dave Jewett who I had the extreme pleasure of working with many years ago at The Columbian Newspaper. Jewett would occasionally start his column with the tag, “a little about a lot,’’ which alerted readers that instead of focusing on just one topic, this particular column would include his thoughts on multiple subjects. Dave passed away on Nov. 5, 2006 in Vancouver. I miss him. He was a great journalist and a wonderful man. I am very thankful to Vancouver Mayor Anne McEnerny-Ogle for sitting down for an interview with ClarkCountyToday.com Reporter Chris Brown on Tuesday, her 100th day serving as the first female mayor of the city of Vancouver. I was also appreciative that she stated an opposition to Oregon’s attempt to place tolls on I-5 and I-205. McEnerny-Ogle is one of three representatives from Southwest Washington serving on the 25-member Joint Public Advisory Committee on Value Pricing, which will soon make a recommendation to the Oregon Transportation Commission on a plan for tolling. I also agree with McEnerny-Ogle that the I-5 bridge needs to be replaced and we need a third crossing over the Columbia River between Washington and Oregon. Where we disagree is the order in which those two things happen. The mayor wants the I-5 bridge replaced first. I, on the other hand, believe there is more urgency for the transportation congestion relief that would be provided by a third crossing than the urgency to replace the I-5 bridge. I admit that, selfishly, I can’t stand the thought of what traffic would be like in this area if an I-5 bridge replacement was done before we got a third crossing. Sadly, McEnerny-Ogle pointed out that Portland’s Metro has no plans to cooperate with the construction of a third bridge. “We look at their 2040 transportation plan, and they don’t have a third corridor in Oregon for a third bridge,’’ she said in her Tuesday interview. McEnerny-Ogle also told Brown that “losing (the Columbia River Crossing project) five years ago was a true heartbreak.’’ It wasn’t a heartbreak for me and many other Clark County residents, largely because of the light rail that was attached to that project. McEnerny-Ogle said, “I do need mass transit’’ as part of an I-5 bridge replacement. She said it doesn’t have to be light rail, which the majority of Clark County citizens have strongly opposed. However, she pointed out that Oregon officials and lawmakers aren’t interested in an I-5 bridge replacement project without light rail. So, here we sit, often times in heavy traffic while traveling between the two states. Seahawks taking a stand against anthem protests? Kaepernick is credited with starting the wide-spread anthem protests while playing for the San Francisco 49ers in the 2016 National Football League season. Kaepernick was out of the NFL last season. No NFL team has worked him out since he became a free agent after the 2016 season. Kaepernick was recently deposed by NFL attorneys in New York regarding his claim that the league’s owners have conspired to keep him out of the league because of his role in the anthem protests. I say, good for the Seahawks. I don’t believe NFL teams should have to conspire behind closed doors to decline to employ Kaepernick if they feel his past or future actions will harm the franchise in any way. There has been widespread exposure to the fact that NFL television ratings and revenues are down and while there is no direct proof of causation between the decline and the anthem protests, most informed observers of the league believe it’s logical to deduce a correlation. As I’ve stated before, I’m not against the players’ right to speak their minds. But for me, the flag and the anthem are sacred. 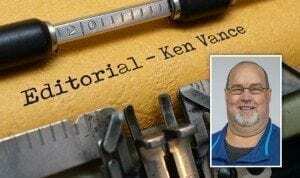 ClarkCountyToday.com Editor Ken Vance shares his thoughts about National Anthem protests in the National Football League. If Kaepernick or any other player doesn’t want to hold the flag or the anthem as sacred, that’s their right. But, it’s the team’s right then to decide whether or not the public response to that decision by a player is worth the benefit of employing said player. I knew when ClarkCountyToday.com Owner and Founder David Madore asked me to create this digital news organization almost two years ago, that it would be a challenge to build something out of nothing. In my now 30-year career in journalism, I’ve had the pleasure of working at The Columbian Newspaper and The Reflector Newspaper — both of which have been present in Clark County for more than 100 years. At each stop, I benefited from the established legacy of each organization. At ClarkCountyToday.com, I was the first employee in the door. The job of creating this venture, in those early days, rested largely on my shoulders. That’s not the case anymore. Our announcement earlier this week of the addition of Reporter Eric Schwartz, in my mind, completes (at least for the time being) a virtual “Dream Team’’ for me to work with to achieve the goals and mission that our founder shared with me in the spring and summer of 2016. In addition to myself and Schwartz, our news team also consists of reporters Chris Brown and Paul Valencia as well as photographer/videographer Mike Schultz and Graphic Designer/Webmaster Andi Schwartz (no relation to Eric). Our administrator and wearer of many hats critical to our success is Heidi Wetzler. Our faithful readers and supporters are going to learn more about this talented team of professionals in the coming weeks and months and I’m extremely confident that ClarkCountyToday.com is on the verge of achieving much greater and grander things as a result of works and efforts yet to come.